This review first appeared in the January 27, 1995 issue of the North County Blade-Citizen (now North County Times). In its original incarnation, fusion jazz blended '70s-era rock with post-bop jazz. Twenty years later, first-generation recordings by fusion acts like John McLaughlin, Weather Report or Return to Forever already have a dated sound, relying as they do the rock sounds of that era. The combo Metro updates the fusion concept for the '90s, combining fast-paced jazz improvisation with the industrial sounds of contemporary rock  and then blends that with a more introspective, romantic side not often associated with fusion. 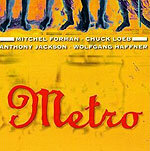 The harder-edged songs ("Metro," "Gravity") are driven by Chuck Loeb's razor-sharp attacks on electric guitar. Drummer Wolfgang Haffner provides a pulsating beat, aided by Anthony Jackson's thumping bass, atop which Loeb builds his solos. Keyboardist Mitchel Forman, who met Loebl two decades ago when both were gigging behind Stan Getz, makes the slower pieces work with his sensitive piano playing  although Loeb is a very expressive guitarist who can play the romantic as well as the aggressive material. What keeps this album from really taking off is the band's tendency on the slower material to drift into a Kenny G-styled smooth jazz, with solos that lack pop or much in the way of imagination.